“Rule One: Always be careful about where you fish and what you fish for and whom you fish with. Rule Two: Be even more careful about what you take home and what you throw back. Rule Three: The point of all fishing is to become ready to fly fish. 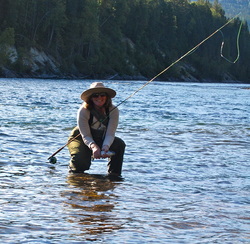 Rule Four: The point of fly fishing is to become reverent in the presence of art and nature. Marj, Carol M and I spent a fun day this past Saturday fishing for salmon on the Vedder River. For Carol and I, the salmon won, as we had no luck in landing one of the elusive creatures. Marj, however, was more successful than we, landing one Pink on her spinning rod and the lucky lure that Randy had picked out for her. Thanks, Randy. We met another fly fisher, Ejay, who was very helpful to we three novices, offering lots of tips on where to cast, what flies to use and even gave us some of his personally tied "dollar store" flies - not to mention offering Marj some of his catch. While we weren't overly succesful in catching fish, we all had a wonderful day on the river. The view down river with the mist rising off the water, the mountains in the background and the multitude of other fishermen lining both sides of the river, , was beautiful. I don't beleive there is such a thing as a bad day on the water. Four weeks. Five fishing zones. I'm back and the fish won! Is anybody interested in going salmon fishing????????????????? Would love to go with somebody/somebodies!!!!! Aren't vacations supposed to fun and exciting times? Then, why is it that I'm feeling conflicted about the vacation I'm about to have (which should be fun) vs staying home & catching some of the multitude of salmon that are coming in now? I have an untried 8 weight fly rod just waiting to be tested. Darn - it will have to wait to another time. I will, however, have some fishing stories to share with my Fish'nChick buddies when I return. I'm going fly fishing in Norway. Way cool, as the kids say. Can't wait to go fishing! So, next week I finally get to head up north to go fly fishing for spring & pinks. Unfortunately I'll only get one day to fish springs before the season closes but what a challenge it would be to land a big one with the fly rod! And then there's pinks after that closes, so wish me luck! I hope you will keep checking in on our blog. I know many of our members have great stories to tell after their summer adventures! They have travelled all over the province in search of great fishing and good times!